>I verified that the username, password, and domain was correct. >I tried hardcoding the server names to sipfed.online.lync.com:443. >I verified her UserPrincipalName and Skype user name in the Office 365 Admin Center. >I reset her password and performed a manual sync from the on-premises AD. >I wiped all of the locally cached Skype data from her Windows user profile and from the registry. >I uninstalled Lync and Office 2010 and installed Office 365 from the portal. There was one fact that kept nagging at me and I was sure it had to be related: She had changed her name a few months before the migration to SfB. Her displayname, email address, and username had all been changed to match, and we usually try to avoid changing usernames just for this reason. Running “Get-CsOnlineUser -Identity first.newlast@domain.com | fl” showed something very interesting. Her former last name was still showing up in these SIP address fields! When her name was changed, someone changed her SamAccountName, UserPrincipalName, PrimarySMTPAddress, and even her SIP address as it appeared in our on-premises Exchange server, but they hadn’t changed her SIP address in the Lync 2010 console. When a username absolutely has to be changed, the established procedure is to ignore the SIP address in the Exchange Management Console, to remove the user from the Lync server and then re-add her from the directory. The SIP address in Exchange is automatically updated by the Lync server, but changing it in the EMC doesn’t automatically change it in Lync. 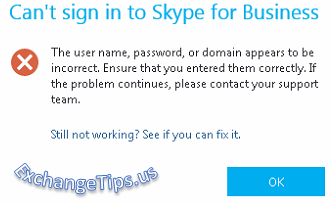 After syncing these changes to Office 365 and waiting a little while, the user was finally able to log into Skype. Set-CsUser -Identity username@domain.com -SipAddress username@domain.com. That’s much easier than editing AD attributes. Second, you might need to remove the user’s Skype license in the Office 365 Admin Center and then re-add it before the address fields will update.